We all are aware of the ongoing controversy related to the film Manikarnika. Kangana in an interview had opened up about Bollywood not coming out in support of her and her movie Manikarnika. The actress had taken the name of Alia Bhatt saying that when Raazi's trailer released, the actress had asked her to watch it and give her feedback and she had done it. "For me, it was not a Karan Johar film or Alia film, for me, it was a film on Sehmat Khan, the girl who had given her everything to the country," Kangana said. 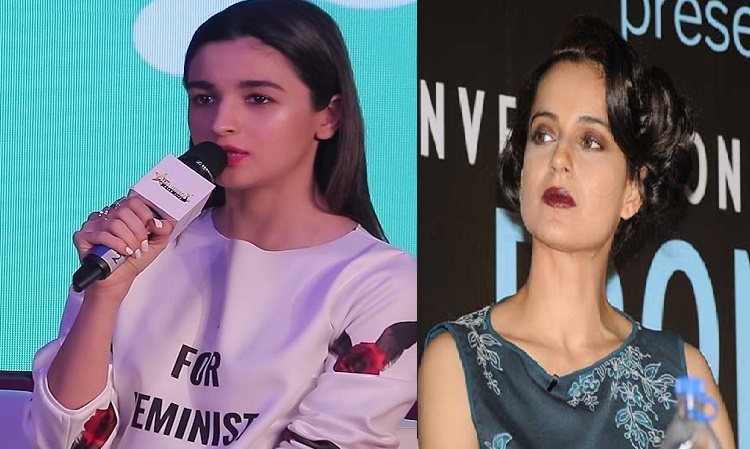 Alia, who has been busy promoting her movie Gully Boy, has now opened up about the controversy saying that while she has been too busy with her shoots, she always supports actresses and actors for the films they do. "I hope she doesn't dislike me and I don't think she dislikes me. I don't think I have done anything intentionally to upset her. If I have, I will apologise to her on a personal level. But I have always said that I have admired her a lot as an actor and person. She is very outspoken and that takes courage to be that way. I wasn't aware of this problem or anything, I was busy with the shooting. So yes, what can I say I don't want to upset anybody", said the actress. Well, we hope Kangana will make peace with Alia. While on the work front Alia is busy promoting her next Gully Boy which is slated to release on 14th Feb and it also stars Ranveer Singh and Kalki Koechlin. The actress is also shooting for her forthcoming film Kalank alongside Varun Dhawan. Kriti Sanon takes the audience by SURPRISE with her dance moves! Priyanka becomes the FIRST global icon to have 4 Madame Tussaud!